Police start charging the bus in Manila, Philippines, after a former police officer took a group of tourists hostage. 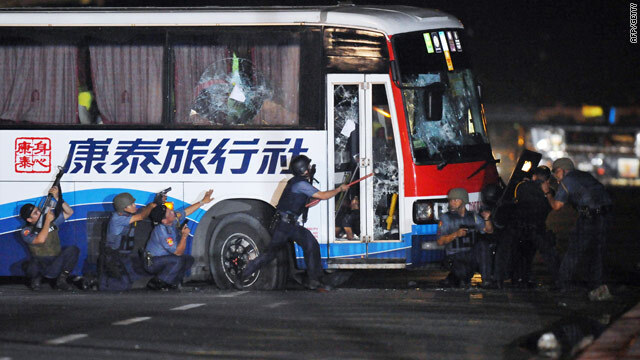 China condemned the "atrocious behavior of the criminal"
Hong Kong, China (CNN) -- Hong Kong urged its residents to cut short or cancel planned trips to the Philippines on Tuesday in the aftermath of a bloodbath that left eight dead on a Manila tour bus. Hong Kong's regional government issued its highest level of travel warnings in the aftermath of the killings, urging all residents to avoid traveling to the Philippines. "Those already there should attend to their personal safety and stay alert," the advisory read. Tour groups were urged to return "as soon as possible," while other groups scheduled to visit were urged to cancel their trips. Manila police said Rolando Mendoza, a former police officer upset at having lost his job, took hostage a busload of tourists from Hong Kong Monday and killed eight of them before being shot dead. One passenger was critically wounded and six others hospitalized with less serious injuries after the 10-hour standoff erupted into gunfire, Donald Tsang, the chief executive of Hong Kong's semi-autonomous government, told reporters. And in Beijing, the Chinese government said Tuesday it "severely condemns the atrocious behavior of the criminal" and expressed its "deep sorrow" and "sincerely condolences" to the families of the victims. "The Chinese government has already decided to send working teams to the Philippines and we will keep close contact with both the Philippine as well as Hong Kong government, putting our best effort into rescuing the injured parties in the aftermath," China's Foreign Affairs Ministry said in a statement on the killings. China has asked the Philippine government "to take concrete action to secure [and] guarantee the protection and safety of Chinese lives and wealth." The incident began at 10 a.m. Monday (10 p.m. ET Sunday), when Mendoza -- wearing a uniform and carrying a rifle -- flagged down the tourist bus and asked for a ride, police spokesman Erwin Margarejo told reporters. A tour guide for Hong Thai Travel tried to stop him from boarding the bus, the company's general manager told reporters. "The gunman said he wanted to have a free lift. Then the tour guide stopped him," General Manager Susanna Lau said. "Eventually, the gunman got on the coach and then asked the driver to lock the door." Lau said the gunman did not threaten people on the bus. Twenty-five people, including 22 foreigners, were on the bus when Mendoza boarded it, Manila District Police Chief Rodolfo Magtibay said. Mendoza wrote his demand that he get his job back on a board and displayed it in the bus windshield. Inside, the hostages appeared calm but confused, Margarejo said. Police cordoned off the area around the bus as they tried to negotiate, and sharpshooters were stationed nearby. Food was delivered to the hostages on board. Manila police official Leocadio Santiago told CNN that Mendoza's family members spoke with him early in the standoff and that he appeared "very reasonable and very psychologically stable." The gunman released nine of the hostages, including a mother and her three children, a man with diabetes, and two photographers. The bus driver also escaped. Around 2 p.m., the Philippine news channel ANC showed images of signs posted on the bus windshield saying, "Big deal will start after 3 p.m. today" and "3 p.m. today dead lock." But two hours later, there were no signs that the situation had changed. ANC showed passengers peeking out from behind curtains of the parked bus and a sign posted on the bus door saying, "Big mistake to correct a big wrong decision." Mendoza was dismissed a year ago, Margarejo said. Manila Vice Mayor Ikso Moreno told CNNI that Mendoza's dismissal was for extortion and that he wanted his motion for reconsideration to be heard. "He felt that it was being neglected," Moreno said. "So he went on hostaging a bus full of foreign individuals. So when we talked to him this afternoon, that's what he wanted." Moreno said that Mendoza's brother was arrested because he was "guilty of conspiring with his brother" and allegedly helped instigate the shooting. Moreno said when he arrived near the site of the standoff in the company of Mendoza's brother and the chief hostage negotiator, "All of a sudden, he kept on shouting, 'Don't let go until they give my gun back! Don't let go! Don't let go!' He just shout, one moment -- Captain Mendoza just fired his gun." Mendoza sprayed machine gun fire at the hostages, a police spokesman told CNN. At 8 p.m. Monday, police stormed the bus, which held 15 hostages, killing Mendoza. In Manila, Philippine President Benigno Aquino III said he had ordered an investigation, and would wait until it is completed before deciding whether anyone should lose his or her job. "As the president, my opinion might already sway the investigative panel, which might hamper them in ferreting out the truth, so I will not do that at this time," he said. Aquino said the news media may have worsened the situation by giving the shooter "a bird's-eye view of the entire situation," but said he had little choice but to let it play out the way it did. "If we ordered a news blackout, you would tell us we were guilty of censoring news," he said. "We did vow transparency." CNN's Sarita Harilela and journalists Constance Cheng, Maria Ressa and Arlene Samson-Espiritu contributed to this report.